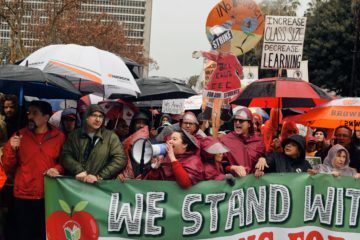 The walls in classrooms and halls at the Math, Science and Technology Magnet Academy at Roosevelt High School changed from one day to another last December, when volunteers began passing out what appeared to be a new poster for United Teachers Los Angeles. Little did students know that the person featured on the new teachers’ union poster was their own history and ethnic studies teacher. 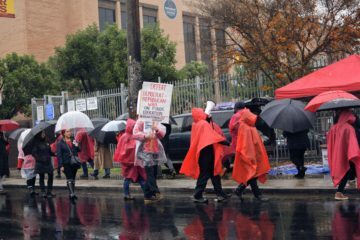 When thousands of Los Angeles Unified School District docents walked out in mid January, Boyle Heights’ Roxana Dueñas became the face of the teacher’s strike. 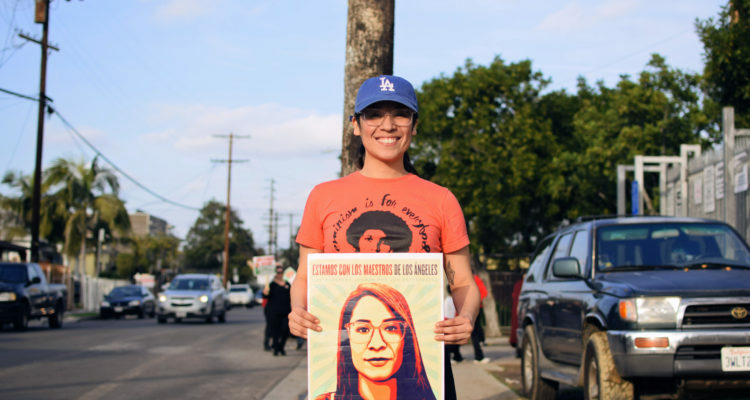 For Dueñas, who grew up in Boyle Heights and who herself experienced the inequality of education as a student at Garfield High School in East Los Angeles, newfound notoriety came with a casual phone call during the Thanksgiving break. Boyle Heights artist Ernesto Yerena –who had done art workshops for some of Dueñas’ classes– asked her to briefly pose for one of several posters being created for the UTLA campaign. Interviewed during a teacher’s protest at Roosevelt last week, Dueñas recalled that she was on her way to the gym when Yerenda called her. She agreed to stop by the artist’s studio after her workout and decided to go without makeup and in a flannel shirt –the kind of look she would wear at work. On the poster she appears wearing glasses and with her hair simply parted at the side. 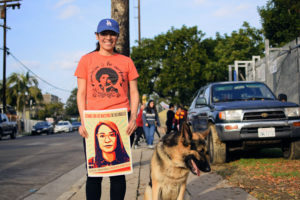 Dueñas did not realize how much she had missed in her own high-school education until she went away to college and took women’s and Chicano studies courses at U.C. Santa Barbara. 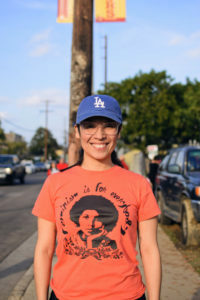 “When I was in high school we did not learn Chicano history, Mexican-American, Latin American history, so for me I thought that would be really cool to go back to my school and community and teach about the things that I would have liked to learn that feel really empowering, engaging and exciting,” she said. As a college student, Dueñas realized that schools in poor, Latino neighborhoods like Boyle Heights were not given the same resources as schools in more affluent neighborhoods. “The idea that they were overpopulated and underfunded really exposed me to the systematic inequality that exists in our schools,” she said. She also learned about the so-called tracking system, whereby high school students are separated by academic ability and the school population is assigned to classes according each student’s measured ability. Roosevelt High School teacher Roxana Dueñas. 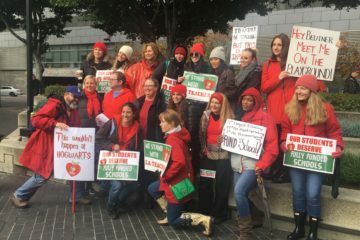 Dueñas said the teachers’ strike was an opportunity to call attention to the persisting inequality in some district schools. 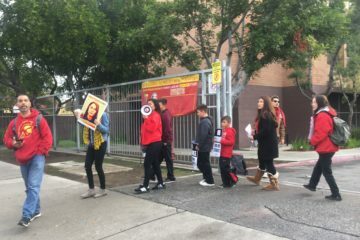 Several Roosevelt students who joined the picket line said they were inspired by Dueñas. Dueñas in turn said she gets her inspiration from the students. All photos by Óscar Vargas.